The Vietnam-era CH-53D heavy lift helicopter made its final mission on Thursday with one last flight over Helmand province. 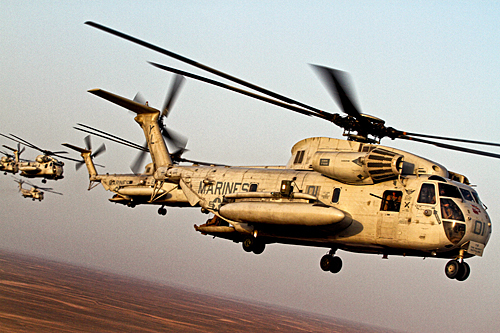 Marines from Heavy Helicopter Squadron 362 from Marine Corps Air Station Miramar conducted the final flight. The squadron, known as the “Ugly Angels,” has used the D model since 1969. The E model, a faster and more powerful make, first entered service in the 1980’s and will replace the Vietnam-era aircraft. Lt. Col. Christopher Oliver, commanding officer of HMH-362 described the D model as “awesome” and said the final mission was bittersweet. “It was about as happy of a flight as you could have in a combat zone,” he said. Oliver told Marine Corps Times the piloting crew had great pride during the memorial flight and said he feels fortunate to have been around the Sea Stallion for as long as he has. “I would bet that all those that have supported, maintained and flown this helicopter in the past would wholeheartedly agree,” he said. The D model was introduced during the Vietnam War and was designed to carry cargo, vehicles, artillery and troops operating in naval environments. The need for greater carrying capacity forced the development of the E model. But Oliver said, even with the introduction of a more capable heavy transport helicopter, the Marine Corps still found good use for the CH-53D. The CH-53K, a faster model with greater carrying capacity is currently being developed by Sikorsky Aircraft and is expected to have initial operating capabilities by 2015. Oliver said the CH-53D should be remembered as a blue-collar workhorse that was always ready to serve. “It shows if you give the Marine Corps something we are going to take care of it for a long time. The American taxpayer got their money’s worth out of this aircraft,” he said. I believe it was this model that flew me and my buddies (3rd Platoon, Alpha Company, 1/8) into Albania in ’97. They kept the big birds at nap of the earth altitude — like a hundred feet or so — and roaring up and over those hills was about as scary as riding a roller coaster. I would have never dreamed that birds that big could fly so agile. I’ll never forget clearing one hill or mountain (hard to tell from the back) and that helo not just dropping, but being forced down lower. My stomach dropped like you wouldn’t believe. Anyway, it was incredible flying, and it was necessary since we came under fire. I think the bravery of pilots and crewchiefs and the crews who service the birds is always underappreciated, so from one grunt (as well as my buddies), I say thanks. Thanks for all the safe flights, resupplies, extractions, etc. I served in HMH-362 in 1978 – 1980 as a crew chief and Mech on the “D.” I later supported them as a Sikorsky Field Service Representative. My hat’s off to all Marines who crewed her and made her a legend. It was hard work but there will always be a fond memory of what was accomplished. SEMPER FI! My service with the “Ugly Angels” was short, but began my career as a 53 flight line mech and Crew Chief. I was transferred to the squadron back in ~1980, right around the time the MAG broke up the old composite squadrons into model specific squadrons. I crewed on a “salty” Flight Line with the likes of Danny Bird, Paladini, Bobby Burdick, Mark Brunson & Lucas, and flew with “tactically seasoned” Pilots like Capt(s) Cook, Strikland, & Johnston before volunteering for the CH-53E program and stood up HMH-464 (CH-53E). My proud membership to this “Vietnam Era” unit was one of the best experiences of my life as well as motivated me to fly “Shitters” for my entire 20-yr career. God bless the service and sacrafice to “All” members past and present, that have had the dubious pleasure of being an “Ugly Angel” SEMPER FI! Sorry to see the CH-53D Sea Stallions retire.I was once a former Marine assigned to HMH-462. Squadron and flew regular mission in this magnifficent aircraft. Semper Malus, Marines. 362 will be reborn. They were H-34s doped up on steroids, continuing 362’s reign of more than a half century as the finest squadron in the Marine Corps. I was in 362, 1954-1957 as 6441 metal smith at LTA Tustin MAG 36 Hanger 2 ,lots of good memorys e4 sgt Loyal Severson. member Together We Serve. I was a crew chief with HMH-361 in Vietnam 69-70 and had one of the first D models delivered to 361 I loved the CH53A’s and D’s Great helicopter and workhorse for the Corps. We are bringing our UH34D to Sikorsky A/C in Oct 2012. My introduction to avaition began when I became a part of HMH 362 in hydraulics in 1979. I then became part of the CH 53E program as a part of Project Support Training in 1980. Dave, do you remember when I hit the Volkswagon coming out of the Lincoln on our way to the school? I stayed with the CH 53E program until I retired from HMH 769 in 1998. I loved every second of it !!! I am an ugly angel with the 53D fro New river 1980-84. Loved every minute of it. With the exception of t he loss of aircraft 13 over Yuma.